Gliding along glassy smooth water, kite in hand and a board strapped securely to both feet, the ocean is a playground. Combining aspects of seemingly disparate sports like wakeboarding and paragliding, kiteboarding is a liberating way to experience raw nature. 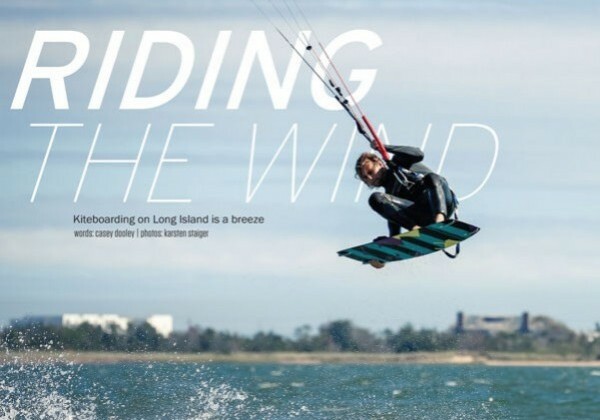 By harnessing powerful wind, riders are propelled over limitless waterscapes—it turns out Long Island is home to some world-class kiteboarding. A smooth breeze rolls from ocean to bay over a narrow, 600-yard land strip and the bay has minimal small-boat traffic cluttering its waters. Both areas offer the same ideal characteristics: Water shallow enough to stand in, few waves, no reefs or beachgoers to worry about and they are surrounded almost entirely by land so there’s no fear of blowing offshore. This also means that wind from any direction is useable—for a sport that relies on a kite for lift, wind is a major factor. “I would say a good 80 percent is kite flying,” said Pereira. “Once you have the kite skills really down, then riding on the board is easier.” The first lessons take place on land where students use a smaller trainer kite with just the bar (no harness), maneuvering the kite by pulling the bar like a bike handle. Students get comfortable by feeling the strain and ease of the kite lines as it passes through different “wind windows” (marked off like the positions of a clock, 3 and 9 at the horizon, 12 at the top). It can be tricky and takes some practice. “The kite is the hardest since it is finicky,” said fashion designer and newbie kiteboarder Nicole Miller, who learned the ropes on Napeague Harbor. “The board seems to be the easier part of the equation.” Miller picked the sport up three years ago through local rider Linda Argila and her Dream Extreme kiteboarding clinic—a fundraiser benefitting domestic violence victims (details on p. 176). Miller, too, was pulled in by the power of the wind and the challenges of controlling the unruly. “You are always looking towards your next milestone,” she said. As with any sport patience is important—there’s a clear learning curve for something so calculating. 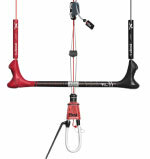 It’s a gear intensive sport that can be expensive to master, in both time and money. Buying enough lessons and gear to become proficient can cost $3,500. But despite this high initial cost, kiteboarding offers something other sports (like wakeboarding) don’t: Independence. “Once I was able to go on my own, I was like ‘This is great!’” said Diaz when he untethered from the restrictions of needing a boat to pull him. “There’s nothing like looking over your front shoulder and seeing you can go wherever the hell you want.” Kiteboarding offers freedom and the challenge to ride anywhere—upwind, downwind, carving back and forth (“mowing the lawn” in the lingo) or reaching 20 feet up and pulling a double back roll. For kiteboarding, wind is the only necessity. And the Island’s best wind happens in the fall. Diaz explained the weather mechanics…somewhat. After a few minutes talking about the jet stream, low pressure meeting Atlantic high pressure systems and changing seasons, he paused to gather his thoughts and quickly said, “It creates more wind is all you need to know, you can go on a diatribe for like an hour on the weather.” In the summer, when those interested in warmer water and weather try the sport, there are thermals, or sea breezes. “When Long Island heats up during the day the air rises and it draws air from the ocean onshore… It’s kinda almost like a machine,” said Pereira. As long as there’s smooth, consistent, ocean wind that’s between 12-35mph, riding should be a breeze. For those starting out, there’s no better place than Long Island’s protected waters for catching a safe ride on rushing ocean air. 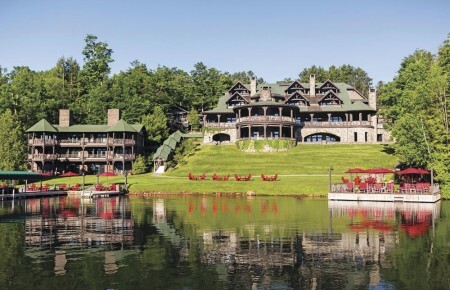 Beyond our shores, there’s plenty of space to enjoy the burgeoning sport at any pace—whether flying high and catching air on the Great South Bay, riding the surf, or just taking it easy “mowing the lawn.” Kiteboarding is ready to take off. The calm, protected waters of the Great South Bay and Napeague aren’t the only options around. Town beaches usually are kite-able, especially after the crowds and lifeguards head home. But kiting at state parks, like Jones Beach and Robert Moses, is prohibited. 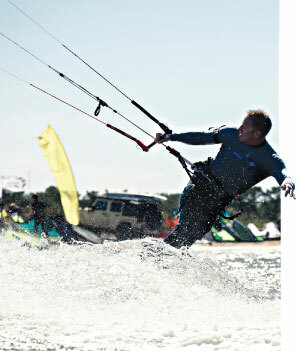 Long Beach: Kiteboarding after six during the summer for intermediate and advanced riders. Mecox Bay: A protected bay with some rougher conditions for beginners. North Shore: The Sound offers riding with some challenging chop when winds blow from the north. Expect beginner to intermediate terrain off of Bayville’s Ransom beach, East Setauket’s West Meadow and Crab Meadow in Northport. South Shore: Montauk’s beaches and Babylon’s Gilgo beach are surfing meccas with more difficult waves and few restrictions, except to stay downwind of surfers. NY Kite Center owner Jon Pereira gives his recommendations for essential beginner’s equipment.